Donald Trump railed about “jobs” leaving states like Michigan and Ohio. But unemployment in Michigan and Ohio is down to 4.5%, excellent and below the national average. Ford is sending work to its Mexican factories building cheap, small cars. But small car production is always destined to go overseas and the fast-rising Mexican middle class buy our goods. Meanwhile those Michigan factories are being retooled to make profitable larger vehicles and no Ford US jobs are lost. "Why at your party's recent convention was there no mention of the most recent GOP presidents? Nor the hames Cheney, Hastert, DeLay, Boehner, Ailes, or any other Republican leaders between Reagan and Ryan? Ashamed, a little?" Name a major metric of US national health that does not do better across the span of democratic administrations. As I show very clearly here. And yes, that includes fiscal responsibility. Why leave the American voters assuming the polemic that Republicans are better on debt? When the opposite is true. Here’s another of those judo challenges. Is Hillary aware (she has to be) that one of the most electrifying moments of her DNC acceptance speech was when she shouted “I believe in science”? Beyond science, name one - just one - knowledge profession that the Foxite cult is not waging war against. Every profession of skill and knowledge in American life, from teachers and journalists to economists, medical doctors... name an exception! But yes, Donald Trump has repeatedly called Climate Change a “hoax” and helped egg on the War on Science. The US Navy has issued many reports expressing worry and asking for more money to prepare for an ice-free Arctic. But this is not just Trump! It should be used as an attack against the Republican congressional establishment. The nerve of the guy, to raise the issue of our bridges and roads and infrastructure collapsing, when it is the GOP run Congress that has blocked infrastructure bills for a generation. And some have openly admitted that it is because the resulting economic stimulation would benefit a democratic president. That is called treason. But that is myopic. True, NAFTA’s short term effects on the U.S. have been fairly minimal. But the same is not true of its effects on Mexico, whose skyrocketing middle class is directly attributable to NAFTA. And a prosperous, middle class Mexico is among the 21st Century events that US citizens should most desire, offering fantastic benefits in both trade and security, downstream. No one mentions this, because pundits do not think Americans are capable of understanding the concept of a positive sum, win-win game. But moving on… the birther lunacy shows how deeply into madness some of our countrymen have plunged. Alas, while the news media has let itself be lured by DT into talking about birth certificates, it’s been easy for racist dopes to convince themselves that such a document can be faked. So it puzzles me why no one mentions how dozens of copies of the August 4, 1961 edition of the Honolulu Advertiser keep turning up in garages all over Oahu, containing the birth announcement of Barack Obama. Please tell us how he faked that -- such super powers. Please tell us, oh hypocrites who happily ignored Ted Cruz being born in Canada. Oh, but the nonsense keeps on fizzing. 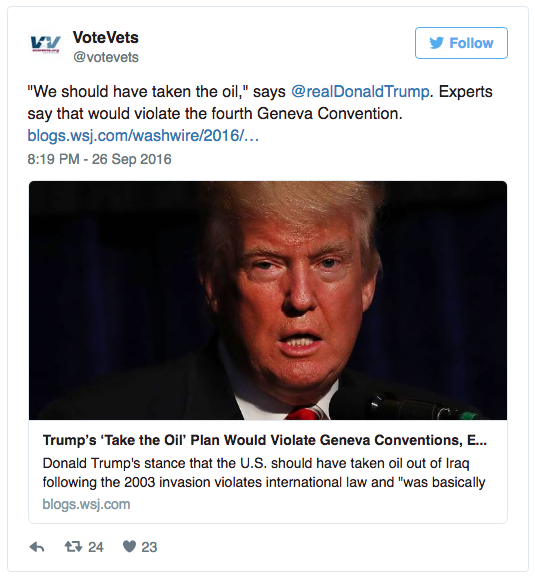 DT: “We should have taken the oil” from Iraq." Really. Wage war against the country we just ‘liberated’? Really. 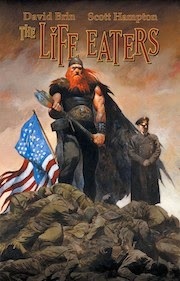 In fact, the last 70 years has featured more (if imperfect) peace and prosperity than any span across the existence of our species, largely because (1) Pax Americana kept that peace, and (2) we deliberately - in the late 1940s - did the opposite of the “winner takes the spoils.” The first conquering empire to be generous instead of rapacious. It has worked. Like scores of mature decisions that confederates and Trump now revile and abjure. Trump was more on-target pointing out that the Obama Administration did poorly preparing the Iraqi military to resist ISIS and handling the aftermath to the ousting of Khaddafi in Libya. These were foreign policy disasters… though the former was 90% a product of stunning incompetence by the Bush Administration, which left an Iraq so hostile to the US that we had to pull all forces. It was not our choice. Trump is also right that NATO partners should shoulder more of the burden of their own defense. This is already starting to happen, in part because of miscalculations by DT’s bromance partner Vladimir Putin. What’s not helpful is screaming at the most successful alliance in the history of the world. The gall of attacking the state of U.S. military readiness is almost as astonishing as the fact that no fact-checker called Trump out about this. Let’s be extremely clear. At the end of either Bush Administration, not a single major US Army unit was “fully combat ready” and in both cases the Army reserves were almost destroyed. In sharp contrast, by the end of the Clinton and Obama administrations, every single major US Army unit was “fully combat ready”. The reserves have been repaired. And the US military is presently undergoing the quickest and most thorough modernization in its history. 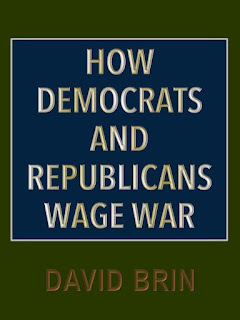 Defense, like crime and fiscal responsibility, should not be left alone as some bulwark assumption of Republican superiority. They are not better at defense. Not even remotely. Despite that, Trump made a good point about North Korea. The payments to Iran though, were simply returning to them their own money, of which we had free use for more than 30 years. Trump claimed a “hundred generals and admirals” support him. Ahem. Those are retired generals and admirals, and proclaiming this so loudly was not patriotic. We do not need even a scintilla of support for any image – ever – of partisanship by the officer caste. I do know that more retired generals and admirals support Clinton, by far. But in this case she’s wise to be reticent and leave it a demure and understated thing. …is the very high likelihood that a President Trump would rashly force our flag officers into choices between obedience to the Commander in Chief vs. faithfulness to the nation and its citizens. This is a very real fear! It is discussed in muted tones, over sour beer, everywhere those officers now meet, after duty hours. Only now, let me turn and accuse the democrats and pundit caste of a genuine unfairness! Re Trump's early ‘support’ of George W. Bush’s Iraq invasion, I actually have some sympathy for him. The one statement on the Howard Stern Show that is used against him is rather weak evidence for “supporting” the Bush misadventure. I don’t mind crediting Trump with being tepid-to-hostile toward Bush’s WMD lies and concocted excuses for a war that killed 5,000+ Americans and perhaps a million other people while benefiting only Cheney family companies. And Iran. What is not permissible is for Donald Trump to shrug off association with the political party that deliriously supported both horrifically awful Bush presidencies and that fostered the War on Science and other insanities. Which brings us full circle to Hillary Clinton’s worst and most cynical sin. In hoping not to offend wavering moderate republicans and drawing them to vote for her, she has chosen to ignore the Republican Party – the elephant that was weirdly missing and never once actually mentioned during the entire debate! This was penny-wise, shortsighted and spectacularly foolish. 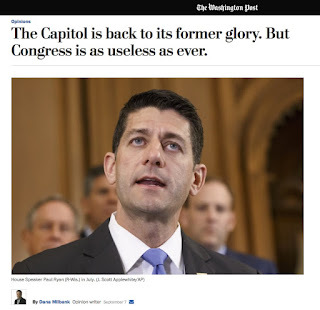 It speaks ill, suggesting shortsightedness, since only a GOP-trouncing will give her – even for just 2 years – a Congress that might pass the legislation that she (and we) need. It also shows he limited perspective on her own self-interest! Because even if she wins the White House, leaving the monstrously dogmatic, hateful and lazy current (Murdochian) version of republicanism untouched will guarantee her presidency to living hell. One of you reminded me about Gingrich’s Contract With America, which was one of the best bits of political polemic in decades. Note that Newt was just about the only Republican leader from the era between Reagan and Ryan who got a mention and a speech at the RNC. Which was sweet revenge, since Hastert & DeLay & Boehner & Ryan betrayed and ousted him. Why? For the crime of actually negotiating with Bill Clinton some bills to benefit America. For that crime, violating the Hastert rule, he was sent into exile. The only sci fi author in Congress. 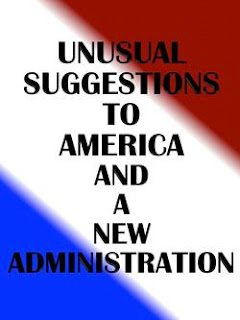 My twenty suggestions to the new administration in 2009 begins here: Unusual Suggestions to America and a New Administration. Notable in the list is a proposal that the dems should study the Contract With America. 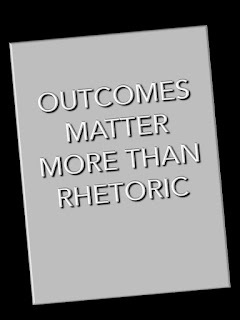 It offers lessons and there are some (mostly liberal) ways that is should be emulated. == Return to Part I: Fact-checking the Presidential Debate. 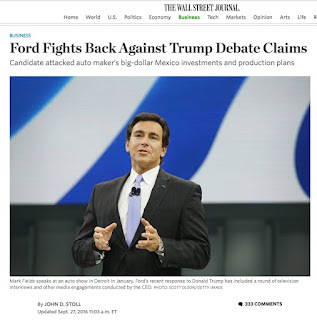 Debate followup: Why 'fact-checking' won't work without... judo! First off, it appears that the press and punditry are overwhelmingly declaring Hillary the winner. And certainly she was, in most ways, first by displaying fiercely intelligent grasp of policy issues. Second, she succeeded in drawing Donald Trump to avow smugness in his true record, a past riddled with predatory and dishonest business practices. Reports tell of sample groups of undecided voters “gasping” when DT proudly claimed to be “smart” by paying little to no federal taxes on annual incomes in the $500 million range. Still, I don't see it as a blowout. In fact, I am highly ticked off at Secretary Clinton, for a rather shallow performance. Too many times, she wallowed in a Sumo match with Trump over this or that line in the sand, instead of using Judo to send him flying. Oh, there are plenty of sober sites and individuals out there doing truthiness checks. (Some of the best were done by NPR , PolitiFact, and The New York Times.) As someone on Twitter quipped: "We're going to need a bigger Snopes." Alas, early on, Hillary Clinton invited viewers to go to her own web-site to scan a real time truth inspection of the debate. Seriously? You expect that to sway undecideds? All it did was add weight to the notion that “facts” are a matter of partisan interpretation. Trump has been very effective telling his followers that when a site like CNN or Politico debunks one of his statements, it only means that they are members of a liberal, “lamestream” conspiracy. “Okay Donald, you dismiss any fact-checking service as biased. Yet the American people need fact-checking they can rely on! So here’s a challenge. You appoint six sages whom you trust – august and respected Americans who will likely serve on your cabinet or as court appointments. I’ll do the same. And we’ll ask retired Supreme Court justices like Sandra Day O’Conner, most of them republican appointees, to pick another six. That sort of thing would corner him. If he refuses or stalls, that fact becomes instantly clear. If he appoints shills, then those twits will compare unfavorably to HC’s choices and O’Conner’s. And if he goes along, he’ll know he’s about to be fact-checked by a service partly of his own devising, designed from scratch to be impartial. In fact, there are dozens of areas where Clinton and the dems could issue simple, direct and unavoidable challenges. 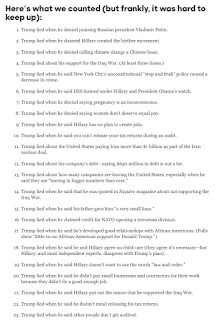 For example, below I’ll offer one that would corner Trump regarding his tax return. It is called jiu jitsu or judo. And by now Clinton should be good at it. Alas, she seems stuck in sumo mode. And I find that unimpressive. Want more such off-angle perspectives? I got a million. Here’s one that’s simply gigantic. It’s… well… huge. I have to wonder – am I the only one who noticed the elephant that was missing from the room? Go ahead and do a word search in the debate transcript. Except for a couple of blithe, offhand references to bipartisanship and past officials who have defected to her, there were no uses or instances of the word "Republican." None by Clinton or Trump. Indeed, if you scan the transcript, you'll find zero uses of the word "Congress," the other and equally important political branch of government that is at-stake in this election. This despite the fact that the Republican Party has dominated Congress for 20 of the last 22 years. Two decades of sullen, glowering indolence, during which role models like Dennis (convicted child molester) Hastert and Tom (convicted felon) DeLay transformed the world's greatest deliberative body into the nastiest and laziest in U.S. history, completely obedient to Fox chairman Roger (sexual predator) Ailes. Sure, democrats have accused these and other GOP leaders of dogmatism in the past. But it is the laziness charge that I find sticks in even conservative voters’ craws. Seriously, who is advising Clinton to lay off Republicans? She could ask: what kind of party does not even mention its last two presidents, during their national convention? Indeed, tally up every GOP leader between Reagan and Ryan -- only one of them was even mentioned at the recent Republican National Convention! The words “Bush” and Hastert, DeLay, Cheney, Rumsfeld, Gingrich, McConnell and so on are unutterable by Donald Trump, or any other Republican, so why does Hillary refrain? Fine. Then use that! The more he says it, the more he’ll undermine and anger down-ticket Republicans. It’s called judo. Oh, this is stunning foolishness in several ways! (2) Suppose she does win, but those same Republican voters then reward GOP down-ticket candidates, returning the Senate and House to GOP control. Then Hillary Clinton’s "honeymoon" as president will last three minutes and the rest will be a volcanic, accomplishment-free, living hell. There is only one way to prevent that, and to give the American people what they need, a functioning second branch of government filled with pragmatic, negotiating adults. (3) Conservative Americans will benefit if their party is demolished – immolated - in 2016, giving them a couple of years to rebuild something that is not just another mad, sequel-froth of Bushes, Cheney, Trump, or Rupert Murdoch. Conservatives might come roaring back as a party of grownups, no longer sending us lazy, dogmatic, gerrymandering cheaters who wage war on science and every other knowledge profession in American life. Hey, it could happen! Two years in the wilderness and you might achieve that wonder! But first. Get out of the peoples’ house. We have work to do. Clinton did really well exploiting Trump’s refusal to release tax returns, luring him into admitting – in fact proudly avowing – that he was “smart” to avoid helping pay for roads, schools and national defense. She’d have done better still by asking everyone in the audience if they paid any federal income tax last year, suggesting it was probably more than Donald Trump did on 694 million dollars. And yet, DT can continue to weasel out by claiming the “IRS audit” dodge, leaving this a matter of (again) sumo pushing and shoving to sway the next 1% of voters. It’s another of those jiu jitsu challenges that would leave him cornered. How could he not ask to have the audit canceled and to get immunity for this year’s returns? Any excuse he made at that point would sound way beyond smarmy and contrived. Sure I know your advisers are saying that the public is too angry to listen to good news. That any attempt to brag over the country’s direction and gains will backfire on you. They are dead wrong. 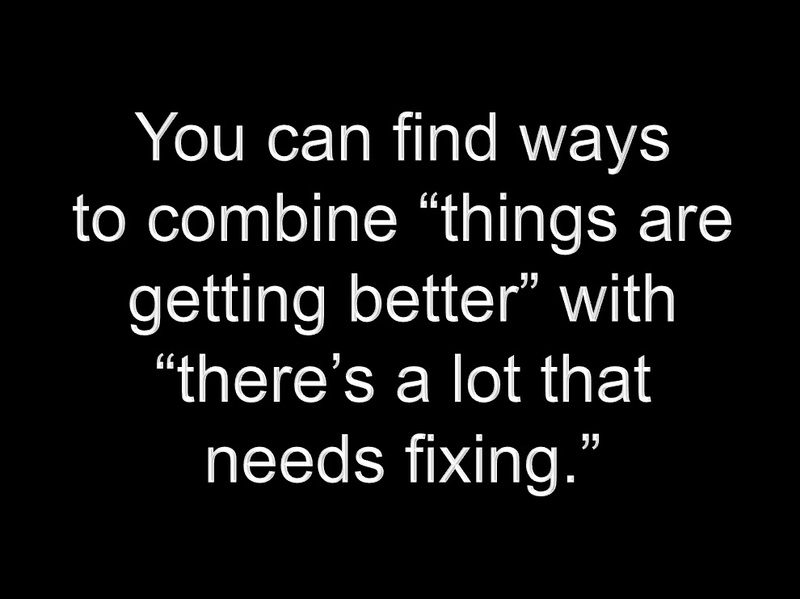 You can find ways to combine “things are getting better” with “there’s a lot wrong that needs fixing.” You have tried to do that, I admit… and done miserably. Sure, you offered one sentence about how crime has overall declined. A lot, since your husband was in office. One sentence. Almost as if you were embarrassed. Sure, FBI crime data published Monday said violent crime rose slightly in 2015 but remains near record lows. A few hot spots like Chicago have surged with violent crime, but even in Chicago, it’s limited to a small number of neighborhoods. Yes, we have some degree of crisis. But cowering and whimpering and dividing Americans will not help. Hey how about mentioning how technology is empowering both good cops and citizens, and law and order should be a lot better, once we work out the kinks on this transparency thing. The Foxites have blocked sustainables at every turn. But they are arriving anyway. Arriving huge. And I will offer further post-debate appraisals… more ways to do judo… next time. 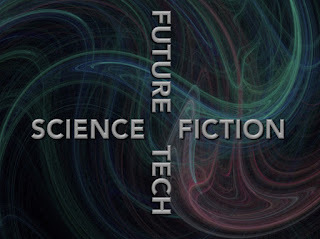 At the intersection of Science Fiction and Future Tech, plus sci fi reviews! Dig it... two sci-tech postings in a row! Because despite the ravings of media and politicians, they are no what's taking this spectacular civilization forward. Some of them hamper and some help, but the real action is out among the brilliant innovators, explorers and -- yes, amateurs like you -- who are engaged in the Greatest Adventure. Can AI and robots learn ethics? 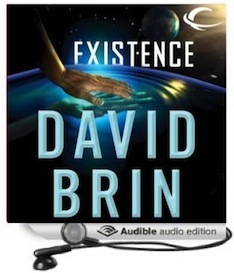 In Preparing for our Posthuman Future of Artificial Intelligence, on Omni Reboot, I review a dozen books whose authors range from optimistic to pessimistic to weird… and conclude (as you will) that all of them miss a vital point! In Deliver us from the fury of the cyborgs and grant us the peace of cyberspace, evolutionary biologist P. Z. Myers gives a more skeptical assessment of the future of AI. Smart. But mine is better. In this sci-fi short film, Uncanny Valley, we get a dark look at the possible implications of virtual reality, and what happens when the lines between reality and fiction begin to blur. Here's a fun infographic showing 25 plausible future techs that will change daily life and that were predicted by science fiction. Surgically implanted memory prosthetics… are now being tested on human subjects by Los Angeles startup, Kernel. With interscatter communication, ‘Eye phones’ communicate with smart contact lenses to monitor blood sugar levels and other physiological data. Mind-controlled nanobots could precisely release drug dosages inside your brain. I look forward to seeing the movie, Sully... anything with Tom Hanks in it. But as this article by Stephen Cass makes clear, the film spews hate against civil servants and the concept of competent government. 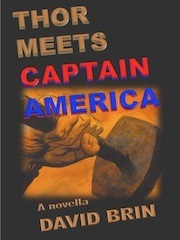 In his recently published memoir, Capt. 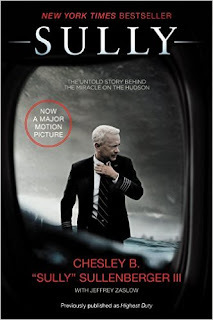 Chesley Sullenberger lauds the skillful fairness of the NTSB, who never, ever hounded or tried to railroad him and who drew correct conclusions, calmly, sympathetically and professionally. Every negative portrayal in the film is an outright, lying piece of propaganda. Yes, it is natural in some ways to do this. 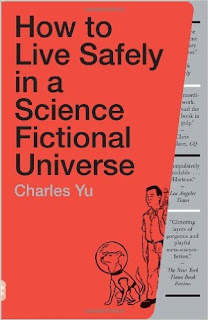 Modern fiction, especially film, is propelled by several standard motifs. Danger, heroism vs opposition, plus themes of Suspicion of Authority (SoA) whether it be Sauron, an evil emperor, a nasty corporation or government civil servants. 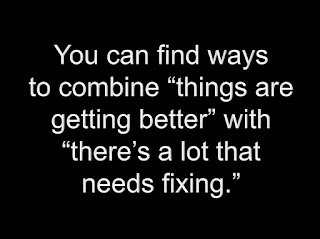 (Especially the latter!) Other prevalent themes include tolerance, diversity, personal eccentricity... and I feel most of these are positive themes, overall! But elsewhere I show how these wholesome memes regularly metastacize into a pair of evil messages that are savagely hurting us all -- (1) that a hero cannot count on neighbors and citizens because they are all sheep (utterly belied by the events of 9/11)... and (2) that no institution can ever be trusted. These memes are cancerous. Mr. Eastwood often gives us good movies, when he stays focused on the small scale. He has fine directorial instincts. But by giving in to the politically, polemically-lazy reflex, he has taken a good story and turned it into yet another dollop of poison. See the whole memic structure of modern film and fiction here, and you'll realize how laziness has turned so many directors into enemies of a civilization that's been very very (and five more "veries") good to them. 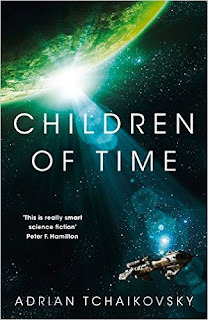 Winner of the 2016 Arthur C. Clarke Award for science fiction literature, Children of Time, by Adrian Tchaikovsky, offers a vivid long-scale look at human destiny. 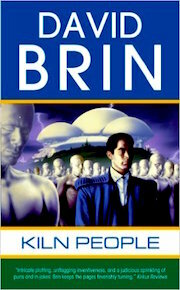 The crew of the starship Brin 2, led by scientist Avrana Kern, set off on a terraforming expedition to a distant planet, to establish a future home for humanity. But… the actions of a saboteur destroy the ship. 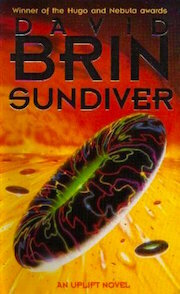 Kern escapes in a cryosleep pod after launching planetward a pod of monkeys and an ‘uplift’ nanovirus – which inadvertently finds a home among the invertebrates of Kern’s World, increasing their intelligence (and complexity of their social web) generation by generation. Meanwhile, centuries of war and plague have rendered homeworld Earth uninhabitable. The last survivors follow ancient celestial maps to reach worlds terraformed by their distant ancestors. They arrive to find that their anticipated new home is not quite what they had anticipated… A compelling read! 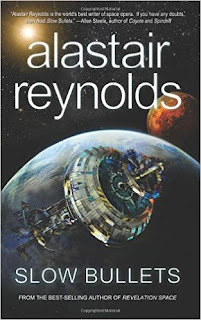 Slow Bullets, a novella by Alastair Reynolds. 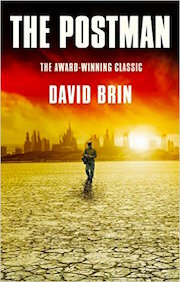 In the aftermath of a brutal interstellar war, a conscripted soldier, Scur is captured and tortured by Orvin, a vicious war criminal, who injects her with a slow bullet (a kind of internal data tag that wreaks havoc on the body). Left for dead, she wakes up from cryosuspension aboard a prisoner transport carrying soldiers from both sides, along with POWs and criminals. But... something has gone wrong with the ship, for they are in unknown space, with no one in charge, out of reach of any sign of civilization. The ship’s memory is rapidly decaying. 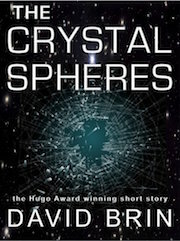 In the chaos that ensues, Scur vows revenge against Orvin -- who is among the survivors aboard the failing starship – even while seeking to save what remains of humanity. 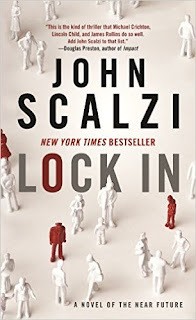 Lock In, a near-future crime thriller story from John Scalzi. A devastating global pandemic has left millions of people (known as Hadens) paralyzed, in a perpetual state of “lock in.” While their body remains bedridden, neural network implants in their brains have been developed to enable them to maneuver through the outside world using personal robotic units (Threeps) -- or by temporarily inhabiting the bodies of other rare humans known as Integrators. The story begins, of course, with a dead body… found in the presence of an Integrator, whose professional code of ethics forbids him from revealing if his body was at work for a Haden client when the murder occurred. Our main character is a Haden, a novice FBI agent operating through his Threep, determined to unravel layers of conspiracy and intrigue, even as he becomes a target. 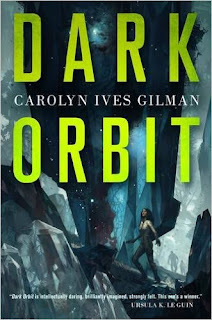 Dark Orbit, by Carolyn Ives Gilman. In this far future universe, interstellar travel is possible, not through FTL, but by lightbeam; individuals are disassembled and reassembled upon arrival. Those who are willing to leave friends and family behind to leap across time and space are called Wasters; in contrast, "Planters" prefer to stay rooted in their own timeframe. 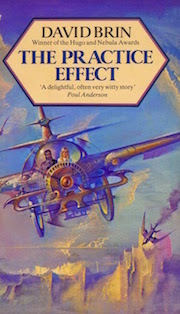 Exoethologist Sara Callicot is recruited to travel by questship to a newly discovered habitable planet, Iris, with its unusual gravity fluctuations rooted in elevated concentrations of dark matter. Upon arrival, the crew makes a mess of First Contact with the crystalline planet’s strange, blind sentient beings. 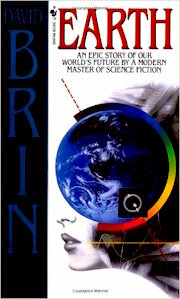 A mix of hard science, philosophy and mysticism, Dark Orbit delves into human consciousness and human nature. 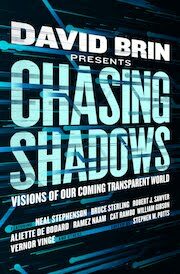 See a more extensive review on Strange Horizons. 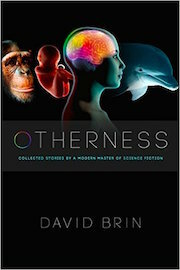 Just released: the audiobook for my second short story collection, Otherness, is now available from Audible. 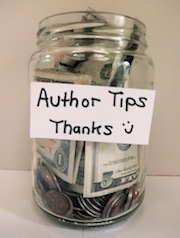 I worked pretty closely with the reader, veteran Hollywood actor, Stephen Mendel. 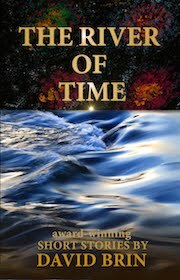 Why not make your commute interstellar and have your strides take you across fate and time? Just how good is SF at foreseeing future tech? 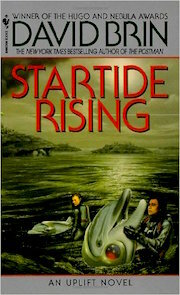 We're just back from the science fiction worldcon, MidAmericaCon II, held in August in Kansas City. Here's a photo from a fascinating panel, Science Fiction Predicts the Future the Way a Shotgun Kills a Duck. 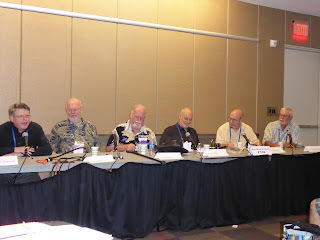 I'm in the middle of panelists Chuck Gannon, Greg Bear, Larry Niven, Joe Haldeman and Gregory Benford. Great fun! And yes, many panels did not just have old male farts. I got to interview the delightful winner of the novella Hugo, for "Folding Beijing," Hao Jingfang, who greeted our family in Chengdu in 2007. So flattered when she called me a "mentor". Keep eyes open for her novel "Wandering Maerth." (Oh, Ken Liu, her translator, was gallant onstage and took home his own rocket!) See his latest collection, The Paper Menagerie and Other Stories. 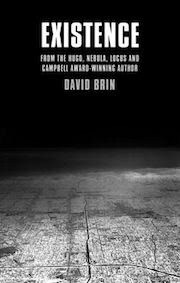 Liu also translated Cixin Liu's The Three Body Problem. Every advanced nation on Earth – and many developing ones – have rapid, convenient, economical high speed rail systems linking major cities, allowing millions to bypass congested airports… except the U.S. Now some rays of light. California is plunging ahead with an HSR line – though funding from Bakersfield to Los Angeles will have to wait. And the Obama Administration has found a way to bypass the laziest Congress in American history by lending Amtrak 2.2 billion dollars to upgrade some eastern corridors to 186 mph with comfortable, modern WiFi rich trains. California’s battle to get high speed rail is like LA’s desperate fight in the 1990s to get metro subways and trains. Right wingers fought it hard... and now we know life would be impossible there without the efficient and economical mass transit system. Seriously, look 50 years from now. The very notion that there would NOT be high speed rail or tube transit up between SoCal and the Bay area is simply absurd. The question for sane folks is how? I am willing to listen to arguments that normal, world class high speed rail is obsolete! Maybe we should leapfrog the rest of the world! As Africa is leapfrogging copper wires. In which case, the most valuable part of the California project is clearing the rights of way. Troglodytes, this will happen. We are a modern, technologically advanced, scientific nation. Get used to it. UCLA neurosurgeons used ultrasound to “jump-start” the brain of a 25-year-old man from a coma, and he has made remarkable progress following the treatment. The technique, called “low-intensity focused ultrasound pulsation” (LIFUP), works non-invasively and without affecting intervening tissues. What is a "Weapon of Math Destruction”? It must be opaque to its subjects, harmful to their interests, and grow exponentially to run at huge scale. This is a clever re-phrasing of the intelligencia’s fad concept of 2016 — otherwise referred to as the Tyranny of the Algorithm. 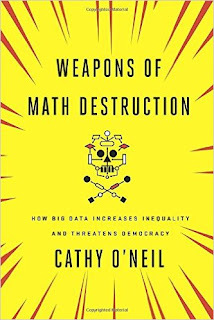 Take a look at Kathy O'Neil's new book: Weapons of Math Destruction: How Big Data Increased Inequality and Threatens Democracy, reviewed on Boing Boing. Are there still folks who watch fox-rants that "humans can't affect the Earth"? A record-tying earthquake in the edge of Oklahoma’s key energy-producing areas rattled the Midwest from Nebraska to North Texas on Saturday, and likely will bring fresh attention to the practice of disposing oil and gas field wastewater deep underground. In this stunning research video you witness - decisively - evolution in action. You’re watching living things facing down new challenges, dying, competing, thriving, invading, and adapting—all in a two-minute movie that makes vividly clear how bacteria develop resistance to antibiotics. But especially that evolution is very real, going on around us, in real time. A teensy silver lining to catastrophic climate change. “Scientists probing a newly exposed, formerly snow-covered outcropping in Greenland claim they have discovered the oldest fossils ever seen, the remnants of microbial mats that lived 3.7 billion years ago.” (I have a scene reminiscent of this in EARTH.) If confirmed, this would push the established fossil record more than 200 million years deeper into the past, with many implications. Of course, science fiction has always danced along the margins between the subjectivity of art and human experience vs. the objective reality that Science keeps saying lies beyond Maya's veil, beyond Plato's Cave. We have to believe science because the results of experiment and of math are both so consistent! And yet, the veil is always there and art - especially speculative literature - lets us poke at it in ways that science cannot. 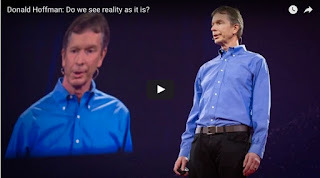 Now cognitive scientist Donald Hoffman, a professor at the University of California, Irvine, suggests that our problems perceiving the objective universe may be rooted in evolutionary biology. 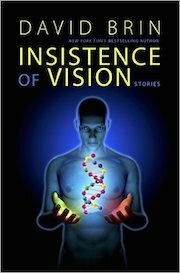 "Given an arbitrary world and arbitrary fitness functions, an organism that sees reality as it is will never be more fit than an organism of equal complexity that sees none of reality but that is just tuned to fitness." Innovation: Stanford researchers have invented a version of polyethylene — kitchen wrap— that can beincorporated in clothing that allows infrared energy to pass straight through, while being opaque to visible light. (For clothing, duh?) A second issue: polyethylene does not permit water to pass through, was also fixed. The new material allowed a surface to cool more than a cotton garment by 3.6 degrees Fahrenheit, suggesting such coatings might save up to 45 percent of the energy required for cooling inside a building. 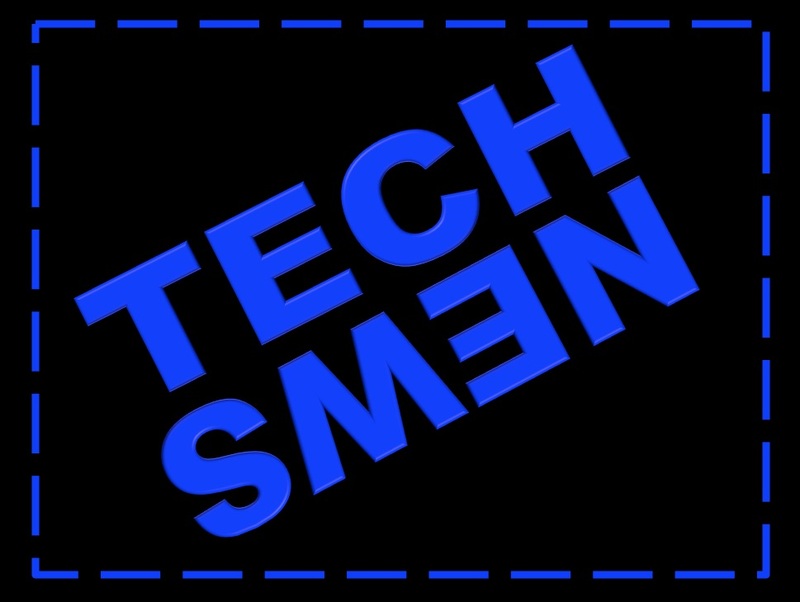 One of two dozen tech zones where, if early promise comes true, we may change the whole game. How about a long-lasting, safe, zinc-ion battery -- water-based, using cheap but safe, non-flammable, non-toxic materials, compared to expensive, flammable, organic electrolytes in lithium-ion batteries that cost twice the price. It could help communities shift from traditional power plants to renewable solar and wind energy production, where electricity storage overnight is needed. Google is developing a quantum computer in a 48-qubit grid that it believes will outperform the world’s top supercomputers. Fujistu Semiconductor Ltd. has become the first manufacturer to announce it is mass producing a new RAM that boasts 1,000 times the performance of DRAM but stores data like NAND flash memory. The new non-volatile memory known as Nano-RAM (NRAM) was first announced last year and is based on carbon nanotube technology. Because it uses power in femtojoules and requires no data clean-up operations in the background, as NAND flash does, NRAM could extend the battery life of a mobile device in standby mode for months. Episode two of Popular Science’s new sci- featurette show Future First is titled "Artificial Intelligence: Your Tutor and Nurse," features Ben Goertzel, and takes a look at artificial intelligence and its potential applications for education, health, and more. A topic I’ve been talking about a lot lately. (It feels like a sudden wave.) 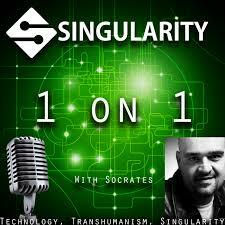 Oh, Episode number four will feature me as a head talking about SETI and METI and the Fermi Paradox. You know. All that. This fellah took the original schematics for the legendary CURTA hand-cranked calculator (1940s) and refined tolerances to produce a 3D printed version. And now that he’s done it, that means YOU will be able to do stuff like this, within the decade. And as I have been saying for 30 years… we are entering the Age of Amateurs, when no truly good thing will ever again be lost. We’ll, if you don’t count Nature…. A kewl and fun video about the Commodore 64! Which my son and I bought later in original packaging for 75$ (you can’t do that anymore) in order to solve a real problem which I describe here: Why Johnny Can't Code. And this followup. Here's an appeal to the group mind. Someone have a look at this series and report back to us? This series from Terrafiniti addresses important topics… but also may be a be New Agey: “Towards 9 Billion addresses the critical issues that face our planet in the 21st century, from business and economics to sustainable energy and technology. 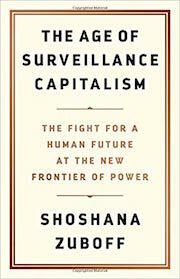 I love its wide-ranging intelligence, lucid prose and interdisciplinary approach to scoping a new economics for our age.” Topics include: What’s the Point of Capitalism? And 21st Century Natural Philosophy. Yet, these are important topics. 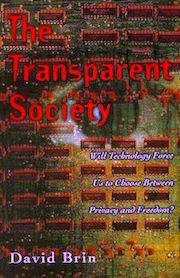 The books are free to download and – according to Joss Tantram: “consist of analysis and big ideas for how we might evolve our systems of value and production for a sustainable, equitable future. They also include discussion on the challenges of communicating unpalatable truths and the rise of truthiness rather than scientific method.” Okay. So let’s see which endeavors actually uplift the conversation. Huh! New research suggests that most teens aren't vaping nicotine at all, but using "sweet and fruity flavors" like strawberry, chocolate cake and bubble gum. Mind you, it's still irritating to be near one of these rude "vaping" twits. But teens have a right to be rude twits - a bit, some - I guess I was! Meanwhile though, this is much smarter and less noxious.